Washington, DC — The Secular Coalition for America released a statement today condemning the House Committee on Appropriations for voting to advance a bill that would allow churches to engage in electoral politics while maintaining their tax-exempt status. The 2018 Financial Services and General Government Appropriations Bill contains a provision, Section 116, that instructs the IRS to cease enforcement of the 1954 Johnson Amendment exclusively for houses of worship. 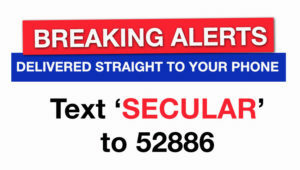 On Tuesday, the Secular Coalition for America and thirteen of its member organizations sent a letter to the Chairman and Ranking Member of the House Appropriations Committee urging them to remove Section 116 from the bill. Additionally, the Secular Coalition joined 107 nonprofits and religious groups in a letter urging the Appropriations Committee to leave the Johnson Amendment intact. On Thursday night during the markup session, Representative Debbie Wasserman Schultz (D-FL) introduced an amendment to strike Section 116 from the bill and preserve the Johnson Amendment. The amendment was rejected in a 28-24 vote.